Recently Forbes.com reported that scientist can now read what you have been reading. In that article, it is explained how scientists can now read the exact letters that you recently read and basically know what is in your mind, literally. If you thought that was the end of the world then wait a minute; researchers at the University of Washington have come up with an interface that allows, Bob, for example, to remotely control the finger movements of Jane through the Internet. Speaking about the interface, one of the developers, Mr. Andrea Stocco, said, “The Internet was a way to connect computers, and now it can be a way to connect brains. We want to take the knowledge of a brain and transmit it directly from brain-brain”. Brain-brain interface technologies have been active for decades but testing has been restricted to mice. For the first time Andrea Stocco and his colleague Rajesh Rao were able to apply the technology on themselves. The interface requires a transcranial magnetic stimulation coil to be paced on Jane’s head. Bob being the one to send the controlling signal, wears a cap fitted with electrodes that are hooked up to an electroencephalography machine and thinks of some action to perform. The action thought by Bob is transmitted to Jane’s brain who will in turn translate Bob’s thought into action. I think, you do! 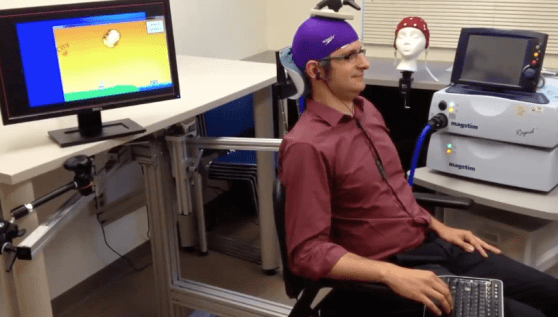 Rao and Stocco tested the technology on themselves where Rao was the one hooked up to the electroencephalography machine while Stocco, on the other side of the University, wore the cap with transcranial magnetic stimulating coil. Stocco’s cap was placed directly over his left motor cortex which controls hand movement. Rao played a simple video game within his mind by imagining that he was moving his right hand to fire a cannon (all mental)…and the miracle happened; Stocco’s finger moved! Stocco’s finger moved and hit the keyboard’s space bar, firing a cannon. The researchers for the first time have demonstrated that it is possible to control another person’s body just by thinking about it. The technology is albeit in early stages and cannot be used to initiate complex maneuvers, Stocco cautioned. The implications of this technology on human progress and security risks is not yet known but University of Washington professor of psychology Chantel Prat said that “there is no possible way the technology…could be used on a person unknowingly or without their willing participation”, which I highly doubt.